Steal a shipment of limeware from a ship at the docks. Obtain five Limeware Cups and five Limeware Bowls. 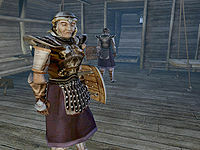 Give the limeware to Alarvyne Indalas or (for a smaller reward) to Bolrin at the East Empire Company offices in Ebonheart. Speak to Alarvyne Indalas in the Glassworker's Hall on Vivec's St. Delyn Plaza. She will complain that Dwemer items are becoming more difficult to obtain, possibly due to manipulation by Bolrin at the East Empire Company offices in Ebonheart. She knows that a shipment of Dwemer limeware can currently be found in the ship Chun-Ook at the docks at Ebonheart and asks you to steal the limeware for her. Specifically, she wants five Limeware Cups and five Limeware Bowls. The ship itself is easy to find, but the door inside is locked and watched by two guards. You can, however, move to the stern of the boat and enter unseen. The limeware is contained in a crate close to the front of the ship, and it includes five cups and five bowls. Watch out for the lone guard and steal the items when he isn't looking. You can return the items to Alarvyne back in Vivec for 1500 gold. Alternatively, you can return them to Bolrin in Ebonheart for 500 gold (for pointing out the lack of security in the operation). Alarvyne will accept any five Limeware Cups and Bowls; they do not have to come from the Chun-Ook. The nearest place to obtain the limeware is from a crate in the Vivec Arena Storage area (accessed from the west end of the Arena Canalworks). The northeast room of the Storage area contains a crate whose contents are identical to the one found on the Chun-Ook. You could also choose to never complete the quest and sell the limeware to any merchant; the base value of all ten pieces comes to 3715 gold compared to just 1500 gold from Alarvyne. For characters with low mercantile skill, however, what you obtain after bartering may actually be less than Alarvyne's reward. Selling the items to Creeper will avoid this problem. If you talk to Bolrin with the stolen goods in your possession but don't hand them over, his disposition towards you will drop by ten. 10 Alarvyne Indalas, a trader in the St. Delyn Glassworks, would like me to steal a shipment of limeware from a ship in Ebonheart. She claims that Bolryn at the East Empire Company has been manipulating the costs, and charging huge mark-ups for all the merchandise. If I steal the limeware, she promises to reward me very well. 20 I have agreed to steal the limeware for Alarvyne Indalas. It is supposed to be held up in customs aboard the Chun-Ook, which is docked in Ebonheart. I should expect it to be well guarded, though. 30 Finishes quest I have decided not to steal the limeware for Alarvyne Indalas. 35 I spoke to Bolrin about the limeware, but did not give it to him. 40 Finishes quest I have recovered the limeware and returned it to Alarvyne Indalas, who rewarded me well for my efforts. 50 Finishes quest I have taken the limeware and returned it to Bolryn at the East Empire Company. He was not happy to hear I was able to breach the security on the ship, but rewarded me for the information, and for the return of the limeware. This page was last modified on 12 July 2018, at 23:46.